Daryl Morey does not plan to improve steadily. When the Houston Rockets entered this offseason, fresh off 54 wins and a very tight but ultimately disappointing first-round series against the Portland Trail Blazers, they planned to build a conference favorite in one fell swoop. They had cap room to sign Chris Bosh to a max-level contract, a willingness to pay well into the luxury tax to re-up with Chandler Parsons long-term, and the brashness to stick with that approach even if it seemed unlikely to succeed. For a few hours, right after LeBron James jumped to the Cleveland Cavaliers, it even seemed like it would work exactly as Morey had mapped it out. Instead, it all blew up right in Morey's face. Bosh chose the money and security of Miami, the Rockets neglected to match Parsons' massive three-year offer sheet from the rival Dallas Mavericks, and Morey plugged the holes with respectable role players who don't figure to help the team improve drastically. The high-profile general manager was also dragged into an ongoing feud with Mavericks owner Mark Cuban that didn't always paint Morey in the most flattering light. 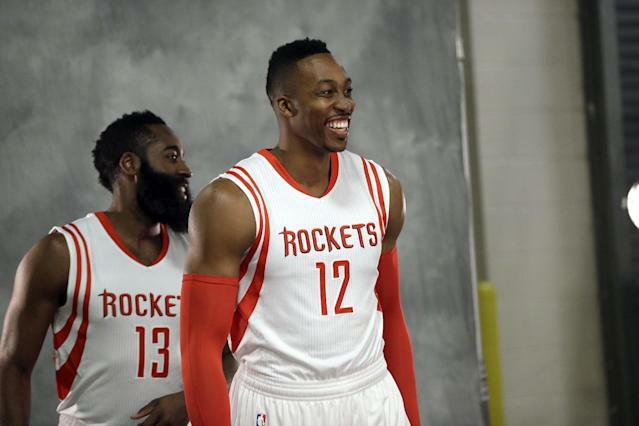 After being the big winners of the 2013 offseason, the Rockets come out of this summer looking like they had the biggest whiff of anyone. The outcome is that one of the league's winningest teams has a curious image problem. By all sober metrics, the Rockets are in a very good situation with two superstars, a roster that can easily repeat its 50-win form, and front-office longevity that is very hard to duplicate. Unfortunately for them, many of those strengths don't look so wonderful in practice. Dwight Howard is still the most complete center in the league and a much better player than he was in Los Angeles, but he carries much of the stink of the years-long process that led to his arrival in Houston. In the backcourt, James Harden's defense has made him more of a punchline than any All-NBA First Team selection in recent memory. Plus, while head coach Kevin McHale appears very well liked in basketball circles, it's not clear that he's the man to lead the team to title contention. Terrible miscommunication in big moments doesn't do a lot for one's reputation. Morey's solution to the team's problems appears to be setting the team up for a big move before every deadline or during every offseason. After this summer, though, he may want to rethink his strategy. Good teams can't afford to stagnate like the mediocre ones Morey assembled to allow him to move for players like Harden. The Rockets may have to learn to engage in just the sort of incremental improvement they seem to consider the last resort. Going out on a series-ending buzzer-beater is statistically unlikely and 100-percent sucky. Not really. Getting unlucky with Bosh makes it seem worse than it was, but the Rockets were only in a position to have that happen because they traded away Jeremy Lin, Omer Asik, and an always coveted draft pick. Losing Parsons to a rival in the wake of unloading the team's best trade chips made for a tough week. Morey bounced back by adding former Rocket and career-long journeyman Trevor Ariza at $32 million over four years, several of which should see him serve as an adequate starter (and others of which are likely not to occur in Houston). Otherwise, the most notable addition is Jason Terry, who had virtually nothing to give to the Brooklyn Nets last season, and 24-year-old Greek star Kostas Papanikolaou, a very good player for Barcelona who will need to adjust to the American game. Morey likely won't be as concerned with 2014's particular misses as the fact that he now can do very little in 2015 and beyond. The Rockets can't trade a first-round draft pick to be used before 2017 and have very few trade assets worth a darn, unless forwards like Terrence Jones and Donatas Motiejunas break out against expectations. Chances are that the Rockets will put a lot of stock in adding a superstar during the summer of 2016, but there's really no way of knowing if they'll be in a good position to do so until that day comes. Two seasons can be an eternity in this league. Ariza is the kind of player any team can use, a plus defender and often very good offensive player who knows his limits. It's possible that he will never match the numbers of his 2013-14 season with the Washington Wizards — his 45.6 percent from the field was his best mark since 2008-09, while his 40.7 percent from deep was easily his career-best — but the Rockets have added a player who can score while covering top perimeter scorers better than Parsons ever did. Ariza won't replace everything Parsons did, but he will improve the team in a few areas of need. There was a time when putting Howard on the floor seemed to ensure a top-five defense. That's no longer the case — the Rockets were 12th in points allowed per 100 possessions last season, a fine result in a vacuum but not especially impressive for a team with championship aspirations. As anyone who has watched Harden knows, some of the issues are obviously related to personnel. But Patrick Beverley is as tenacious as they come at the point and last year's team included plenty of plus defenders. It looks likely that the issues are related to scheme. If the Rockets don't improve that defensive efficiency mark this season, then McHale might want to ask his friends at TNT if his job's still waiting for him. In a way, Harden doesn't have to prove much this season — he just has to show that he cares enough to work on defense. Lots of elite scorers have turned a little lackadaisical on defense as their stars rise, but Harden has gone so far in the other direction that his sluggishness threatens to eclipse his terrific offense. He has said that he knows he has a problem, but those claims feel a little empty after coming into camp as Team USA's lockdown defender before the 2014 FIBA World Cup and being nothing of the sort in the tournament itself. We know Harden will be a net-positive for Houston, but enough is enough. Forward Terrence Jones made big leaps in his sophomore season, averaging 12.1 points on 54.2 percent shooting from the field and 6.9 rebounds in 27.3 minutes per game. With Parsons gone, the Rockets figure to count on him for more scoring punch and bigger contributions around the floor. The Rockets have several players in the same position, but Jones has the best chance to step up to another level of production. Howard becomes increasingly dominant as his nagging injuries become a thing of the past, Harden finds religion on defense, Ariza maintains his strong shooting percentages, the coaching staff comes up with a superior defensive scheme, and the Rockets surprise everyone to make the NBA Finals. Howard's injuries return, Harden inspires several more viral videos of his terrible defense, Ariza regresses, no one steps up, and the Rockets limp to a mostly uncompetitive first-round exit.